Outside, America’s leading multimedia active-lifestyle brand, features Active New Zealand Cycle Tours in its first-ever Active Travel Awards. The 8-day cycling tour on the South Island of New Zealand, The Zone, is included as part of the award for Best New Adventure Hub: Lake Wanaka, New Zealand. Active New Zealand Cycle Tours has been selected by Outside, America’s leading multimedia active-lifestyle brand, as a featured outfitter in its first-ever Active Travel Awards in Outside Magazine's April 2012 issue. Active New Zealand’s 8-day cycling tour, The Zone, which includes a 40-mile ride from Wanaka to Queenstown, was honored as part of the award for Best New Adventure Hub: Lake Wanaka, New Zealand. The full list of award winners is published in the April issue of Outside magazine, available on newsstands March 13, 2012 and online at Outside Online. “Outside magazine has long been one of the world's most trusted advisors for active and adventurous travelers," says Outside editor Christopher Keyes. "This year we've bottled up 35 years of collective wisdom to select our first Outside Travel Awards, an annual edit franchise that honors the best trips, hotels, lodges, luggage, islands, and new destinations that will be an invaluable travel resource for years to come. 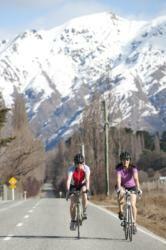 Active travelers who are interested in a bike tour on the South Island of New Zealand can enjoy the same local knowledge and high level of personal service that Active New Zealand has provided to over 14,000 travelers looking for the best way to experience New Zealand since 1996. Active New Zealand launched 4 pure road cycling tours in 2011 following the success of their established mixed terrain, mountain and road biking Weka tour, which was rated as one of the “Best Outdoor Adventure Trips for 2006” by Outside. Active New Zealand also run hiking and outdoor adventure tours throughout New Zealand. Several of their tours feature a scenic and less-challenging bike ride between Lake Hawea and Wanaka. Complete itineraries can be found at http://cycletours.activenewzealand.com or by calling 800.661.9073 for a free brochure or more information.